Unfortunately, bat signals are illegal in Arizona. I was driving around this past December with a friend who remarked that a business that had moving spotlights pointing up at the sky was violating of a city ordinance. This inspired me to be a legal geek and look up why bat signals are illegal in the Arizona criminal laws and the Phoenix city ordinances. Here’s what I came up with. Disorderly conduct is a catch-all law written to apply to activities that the powers that be dislike but where there isn’t a specific law on point. The Arizona disorderly conduct law prohibits excessive noise, but not excessive light. The law does prohibit “fighting, violent or seriously disruptive behavior,” but there may be an argument that a bat signal may be disruptive, but it shouldn’t be treated as being in the same category as physical violence. I think this is what you might get if your neighbors call the cops on you. In Arizona it’s illegal to do anything that is “injurious to health, indecent, offensive to the senses or an obstruction to the free use of property that interferes with the comfortable enjoyment of life or property by an entire community or neighborhood or by a considerable number of persons.” If your bat signal is so bright that it interferes with your neighbors’ ability to enjoy their property, it could be illegal. In Arizona, a criminal nuisance is “conduct either unlawful in itself or unreasonable under the circumstances,” such as a person who “recklessly creates or maintains a condition which endangers the safety or health of others.” I could see law enforcement making a strong argument that turning on a bat signal could be hazardous to other’s safety, especially if it limits people’s ability to see or disrupt traffic on the streets or in the air. The City of Phoenix has city ordinances that require outdoor lighting to be shielded and/or filtered – including spotlights. The City also has rules against disturbing the peace or creating a nuisance that is “offensive to the senses.” The rules for using a searchlight say you can’t have one within 150 feet of a residential structure, that it can only be used between 8 a.m. and 10 p.m., and it can’t contain any advertising. I don’t think my bat signal is advertising because I’d use to get people to bring me ice cream, not to sell anything. 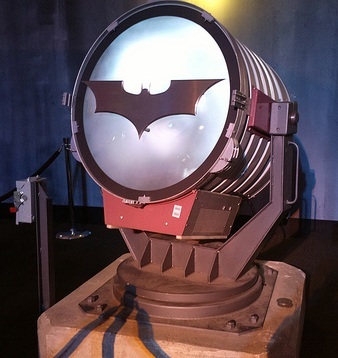 I suspect if you want to have a bat signal, you’d have to get a permit to use it only for a special event and then after that it could only be used for show. The Phoenix rules require you to file for a permit at least 45 days in advance. I can’t plan my ice cream cravings out that far. It’s too bad – it would have been awesome to have a bat signal. If you want to chat more about this topic, you can connected with me on Twitter, Facebook, YouTube, LinkedIn, or you can email me. You can also subscribe to the Carter Law Firm newsletter.